When I opened Pura Vida Body & Mind Spa, I knew I wanted to offer the most popular and effective skin care treatments but what I didn’t know was how AMAZING the body scrubs would actually be. If you haven’t had one yet, believe me, you are really missing out! After having my very first body scrub, I can tell you it is by far new favorite spa treatment. Erika performed the Renew Body Scrub & Massage which was total bliss! She began with a relaxing dry brushing of my skin then scrubbed me from head to toe with a Grapefruit Sugar Scrub that smelled delish. She used hot, damp towels to remove the sugar particles, dry brushed my skin again and then applied Pura Vitale Vitamin E Body oil. That was heaven enough right there but she finished my experience with an amazing massage. Not only was I incredibly relaxed, but my skin has never felt softer or smoother, especially my legs that seem to always be dry and itchy. So, for sure, scrubs and massages are good for your mind, but they are also very good for your skin and your overall health. Accelerating the skin turnover process with good exfoliation stimulates collagen production which contributes to a more youthful and elastic (less crepey) skin texture. Many of us are religious about exfoliating our faces but fail when it comes to the rest of our bodies. Since our skin is the largest organ of the body, why not extend this principle to the rest of you? Consider it a "facial for your body" since it provides your body with the same benefits as a facial. Your body will be massaged after an abrasive product (we offer various types and smells) is rubbed into your skin, taking away the dull top layer. The exfoliating scrub used at Pura Vida is typically based in sugar, salt, oatmeal, or other natural products. You can also have your exfoliants scented with essential oils that have aroma therapeutic effects like eucalyptus and lavender for relaxation. Strip down: Don't worry, you will have full privacy, can still wear your underwear or use our disposable undergarments, and your provider will cover you as much as possible during the scrub. 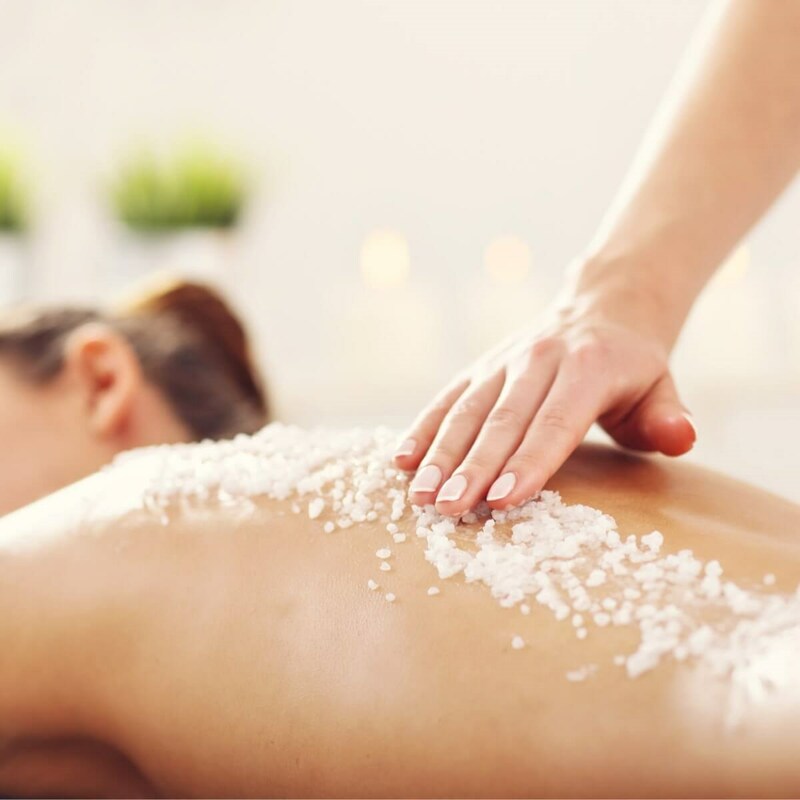 Get exfoliated: Your aesthetician will then come in the room and exfoliate your body by sections while the other areas are covered with your towel. She will use a dry brush first followed by the scrub. Get Rinsed - There will be some exfoliants left on your body, so your aesthetician will rinse your body off using warm damp towels. You won’t get soaked so don’t worry. Get Moisturized- Your body will be moisturized with lotion or oil or, if you have a massage following the scrub, it will be done with moisturizing creams and/or oils. This will prolong the beautiful effects of the full body scrub. What are the benefits of the full body scrub? Aids the appearance of self-tanners by helping bronzing products stay on longer. Helps your lotion and other skin treatments be more effective. Just like a facial will help beauty products better penetrate the skin, so does a body scrub help the rest of your skin benefit from topical skin nutrition. So, what are you waiting for? Treat yourself to this awesome pampering and relaxing skin care treatment asap. You won’t be sorry.